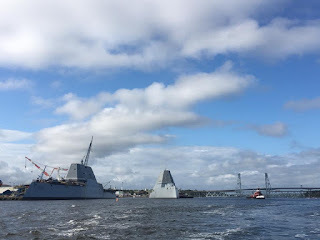 WASHINGTON, -- With the last line taken in, PCU Zumwalt (DDG 1000) eased away from the pier and set sail from Bath, Maine, today, to join the Fleet – culminating years of effort by thousands of people. For Zumwalt’s crew, the call over the general announcing system, “Underway, shift colors” signaled the end of more than three years of training across the country in classrooms, labs and on the ship as our Navy’s next generation destroyer was being activated and tested. 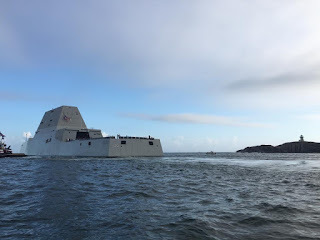 It marks the beginning of the ship’s life at-sea with Sailors at the helm. 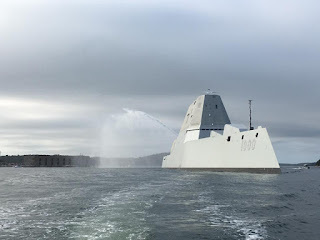 The US Navy’s newest and most technologically advanced surface ship, future USS Zumwalt (DDG 1000) departing Bath Iron Works to begin its 3-month journey to its new homeport in San Diego.